Holly: now I’m going to ask you about dolls. Did you play with any dolls? Holly: What about toy soldiers? Toy soldiers? Gordon: Yes, toy soldiers. Yes. Holly: Tell me about your toy soldiers. Gordon: They were forever getting broken. The heads were coming off and their arms were coming off. Holly: Of that’s not good for toy soldiers is it? So were your toy soldiers important to you? Gordon: Yes. I had a fort. Holly: Yeah? How did you make your fort? Or what did you make it out of? Holly: Yeah. What was your fort like then? Gordon: Quite a big thing. About this high [gestures] and it had a run up drawbridge at the top and a portcullis that went up. I played a lot with that. Holly: Sounds cool. So how did you feel about your toy soldiers? Gordon: I felt they were very important. Holly: And do you still have them? Holly: And what was your best memories of paying with the toy soldiers? 00.04 – Holly: Yep, Excellent. So Gordon, can you tell me where you were born, and when? 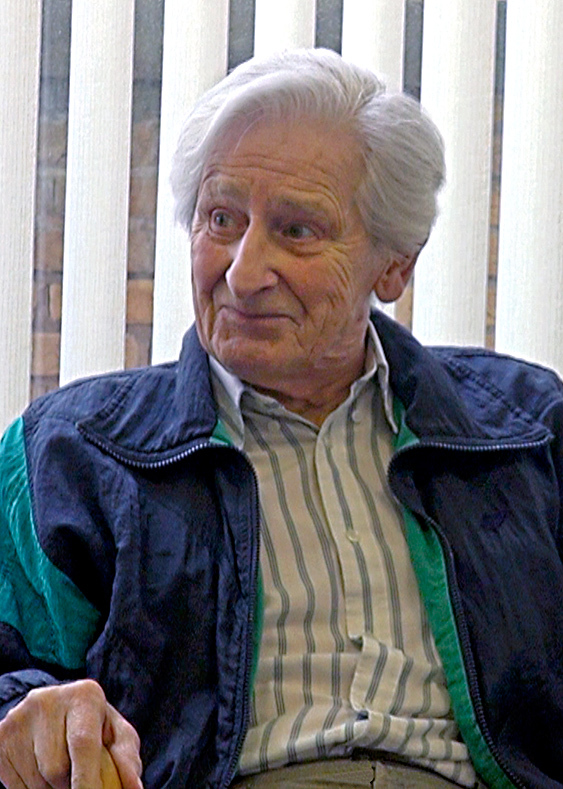 Gordon: I was born in Cardiff in 1929. Holly: Excellent. And where did you spend your childhood? Where did you spend your childhood? So where did you grow up? 00.27 – Holly: That’s a bit of a move from Cardiff. So do you remember having a teddy bear? Holly: What was your teddy bear like? Gordon: I think it was like an ape. Holly: Like an ape. Yeah. Do you want to tell me his name or what sort of material he was made of? Holly: And what was Jackal made out of? What did he look like? Holly: Like soft, or fluffy? Holly: Soft, yeah. And how did you come to own Jackal? Gordon: He was bought for me. Holly: Do you remember who by? Gordon: I think my mother. Holly: So how did you play with Jackal? How did you play with him? What sort of games did you play? Gordon: Used to jump over the bottom of the bed. I used to throw him about. Holly: So how did you feel about Jackal? Was he important to you? Holly: Do you still have him? Holly: And what are your best memories of Jackal? Gordon: He was a good friend of mine. 02.00 – Holly: Yeah? Excellent. So now I’m going to ask you about dolls. Did you play with any dolls? 04.14 – Holly: So finally I’m going to ask you about construction toys. Did you play with any construction toys? So like Meccano, or anything you had to build? Gordon: I used to have lots and lots of bricks, blocks, wood blocks. Every time my father went into town he came back with a bag of building blocks. Holly: So what did you make with your building blocks? Holly: Yeah? What sort of things? Gordon: Quite honestly I can’t now remember. Holly: That’s no problem. So did you have any other construction toys or just the wooden blocks? Holly: No. Okay. And what are your best memories of the wooden blocks? Holly: Of the wooden blocks. Do you remember anything else about them? Gordon: They were on a trolley and I used to pull them along on a piece of string. Holly: So that’s the end of my questions. Do you have any other toys you’d like to talk to us about? Holly: That’s no problem. Was there any toys you wanted but never actually got? Holly: Yep, Excellent. So Gordon, can you tell me where you were born, and when? 00.30 – Holly: That’s a bit of a move from Cardiff. So do you remember having a teddy bear? 02.02 – Holly: Yeah? Excellent. So now I’m going to ask you about dolls. Did you play with any dolls? Holly: Yeah? How did you make your fort? Ort what did you make it out of? 04.18 – Holly: So finally I’m going to ask you about construction toys. Did you play with any construction toys? So like Meccano, or anything you had to build? Holly: No? Okay. I’ve finished unless Dan’s got any questions? Holly: Okay, well thank you. Gordon was born in Cardiff in 1929 but grew up in South East London. He is a member of the art and craft workshop at Blind Veterans UK, Brighton. In the short version (2m 11s) of his interview he talks about his toy soldiers and fort. In the full version (5m 40s) he also discusses his cuddly ape and wooden bricks.